The scenes below are from a production houses in Venice and Murano, a glimpse into the work, the techniques and daily life of a beadmaker. These are the people who produce hundreds daily of the beads we order. Sure we'll have your beads ready soon!!! 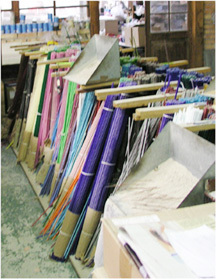 Canes from Effetre (Moretti) furnace in Murano are the first step in making beads. 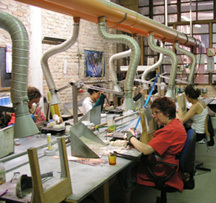 Pictured here are canes at one of our beadmakers. Some colors are more difficult to work (a little slower or they burn out in the flame). Some colors, it turns out are also difficult for Moretti to make. 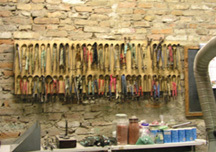 On the wall are tools which help the beadmaker with shapes, more consistent sizing and generally improve production time. They are used for hearts, stars, triangles and other shapes and are made by local toolmakers. Round is a natural shape (though sizing is by eye) occurring with the rotation of the glass in the flame - after lots of practice. Here you see a typical production bead facility with about 8 workers, though it appears there is a vacancy, interested in a job? Work hours are about 8 to 5 with a break for lunch. You can talk or listen to music, but no web surfing and no phones! You do get the month of August off, health benefits and government retirement. Her mother taught her and she taught her daughter. Three generations of beadmakers. Here the first step is getting your cane hot and fluid to begin wrapping around the copper mandrel. See how the cane is a glowing orange-red. The temperature here is about 900 ° Farenheit. 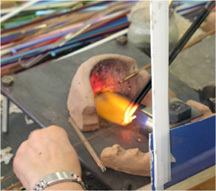 The plastic glass helps prevents popping embers from hitting the beadmaker. See the brown spot on her hand, it's from the popping embers - a tale-tale sign of a beadmaker. 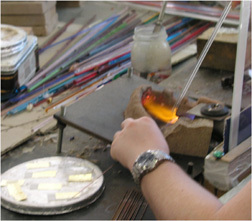 On the right she is making a simple gold foil tube, submerged under crystal clear glass. On the round tray to her left are the small pieces of 24kt gold foil, (gold leaf) which she will wrap around her bead. Most Venetian Beads are made on copper mandrels and when completed are simply chopped (as shown in the picture on the left) off and then in a bath of nitric acid the copper disolves. 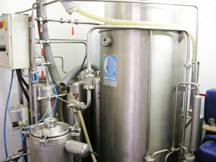 The invention of this process is attributed to Ercole Moretti & filli in about 1935. From antiquity, the beads were made on metal mandrels over which a powder clay had been applied, much like the lampworkers around the world use today. 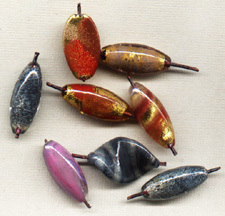 And we do have some beadmakers who use bead release for certain types of beads and we regularly weigh down our suitcases with bead release on each trip over as they like a brand produced here in the US. Here you see the equipment used in the etching of the copper from the beads. The copper is then recycled. Serious equipment! Watch a beadmaker in action! A short clip on beadmaking, note the box to her left, this is the normal cooling process of Venetian beads, it is vermiculite - a silica mixture which holds the heat and gradually lets the bead cool. 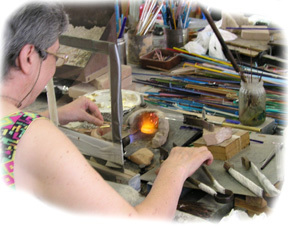 Annealing ovens are used for larger beads/pendants. She's a pro and the bead is made quickly. We hope you enjoy this bit of trivia on how beads are made. 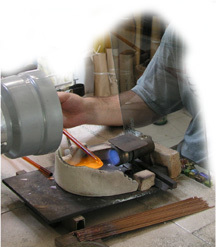 We find it helps sell your work if you understand more about the process and can explain to your customers the history, the techniques and the skill required to produce these beautiful Venetian Beads.